Yet another podcast on Bella in the Wych Elm! This one is put out by a team of Australians and is actually quite good. The team has several researchers who obviously know their stuff. Although this is posted on YouTube, there are no still images which is, in many ways, a good thing, as they don't distract from the overall story. 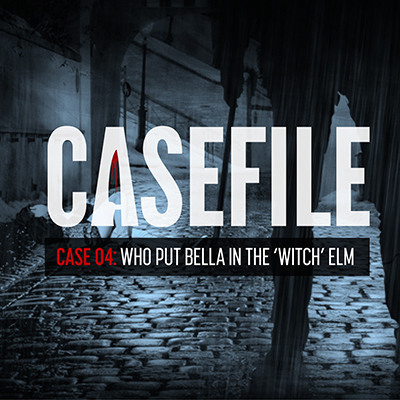 In the 13 O'Clock podcast, reviewed earlier, the still photos often had nothing to do with the case and their inclusion simply muddies the waters as we wonder... "Are those photos actually associated with Bella in the Wych Elm?". The narrator of the Casefile podcast gives a very clear, very succinct summary of the case. Although the podcast is just over 30 minutes long, they do manage to cover quite a bit of territory and touch on all the different versions of events. Even, for example, they note that the taffeta found in the skeleton's jaw was not necessarily conclusive evidence of murder. The taffeta may have fallen out with the skull when it was removed from the tree by police, and been mistakenly placed in the jaw of the skeleton by an officer who thought it came from there. They podcast also references the possibility that the boys actually pushed the piece of the taffeta into the jaw of the skeleton when they were poking it with the stick. I have come across these variations in the story before but do wonder from whence they originate. Are they in the police files? Are these accurate and factual? The show does note the provenance of the Donald McCormick speculations and admit that his research was rather "loose". Unfortunately, they do continue to propagate the errors that Allison Vale introduced into the case in 2013. They make the error of linking cabaret singer Clara Bauerle with one Klara Sofie Bauerle who visited England in the early 1930s. They quote the birth date for Klara Sofie Bauerle, which is not actually the birth date of Clara Bauerle. It is well documented that Clara Bauerle, cabaret singer, was born 27 August 1905 in Ulm, Germany. The host also continues the Vale errors by stating that Josef Jakobs was a Czech national. This is not accurate. Karel Richter (another spy) was the Czech national, not Josef Jakobs. The podcast then delves into the Una Mossop and Van Ralt spy theory. Van Ralt was apparently a Dutchman who spied for the Nazis and bought secrets from Jack Mossop (Una's husband). Listening to the story, I once again wonder... (1) how did Van Ralt get money from Germany to pay Jack Mossop and (2) how did Van Ralt get the secrets back to the Germans? Never mind the fact that there is not a flicker of such a spy ring in the annals of MI5. I do like the fact that the Casefile podcast details all the different variations of the story and notes which one are weak and unsubstantiated. They touch briefly on the witchcraft theory, the possible connection with the murder of Charles Walton (Pitchfork Murder). They end the podcast noting that the skeleton and accompanying autopsy records were lost after being transferred to Birmingham University Medical School. Was it a conspiracy or a cover-up or an accident? Apart from the unfortunate propagation of the Allison Vale errors, this was actually a very thorough and accurate summary of the Bella in the Wych Elm case. I also liked that there was only one narrator of the podcast. When there are two narrators, they end up kibitzing back and forth which detracts from the story, to my mind. On the whole, the piece was well-researched and gives a nice overview of the case. 4.5/5 - very well researched with only a a couple of errors.